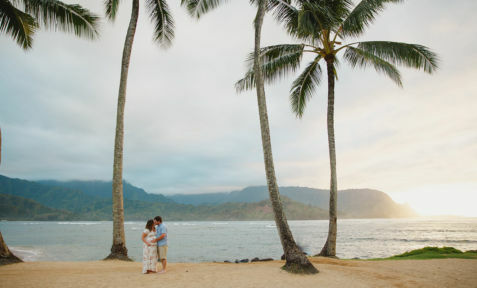 I finally shared some of my own wedding photos after my feature on Junebug Weddings last month. 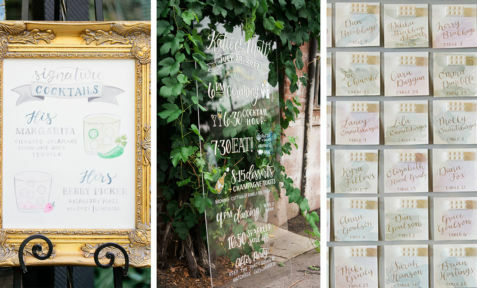 But since I’m in the wedding industry I really wanted to dive into the signage and decor that really helped carry my vision throughout the day and made every detail a bit more personal. 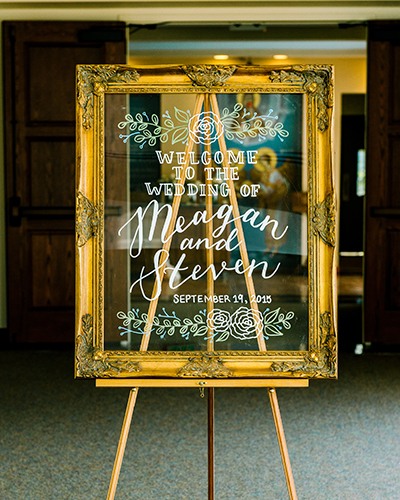 This sign greeted guests as they entered our church, welcoming them to the wedding and letting them know they are in the right place! 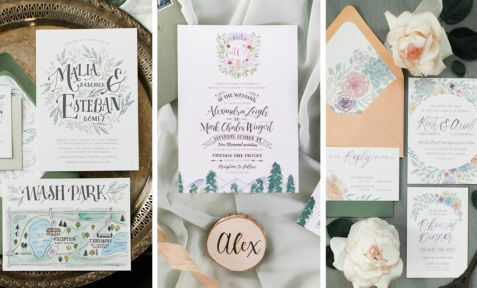 The style of the sign was simple – hand-lettered, calligraphy script mixed with some botanical design elements to mimic our wedding invitations and beautiful floral designs for the big day! 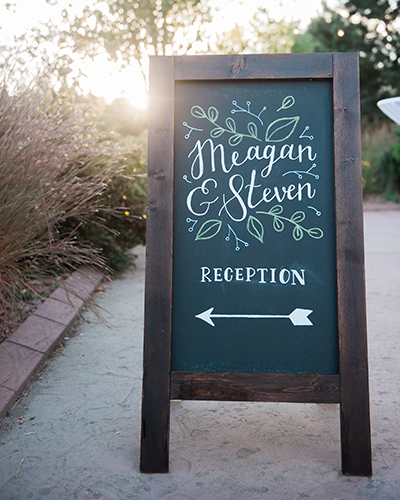 Since our reception site was a little hard to find (the Green Farm Barn further along a pathway at Denver Botanic Gardens Chatfield) we included a directional folding sign to point everyone in the right direction. A fun phrase to start the night off right! 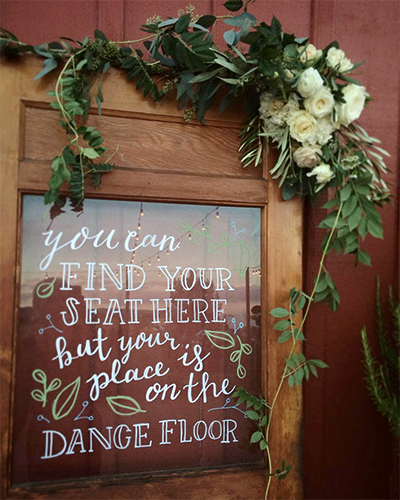 “You can find your seat here but your place is on the dance floor” hand-lettered on a vintage door with a glass window insert. 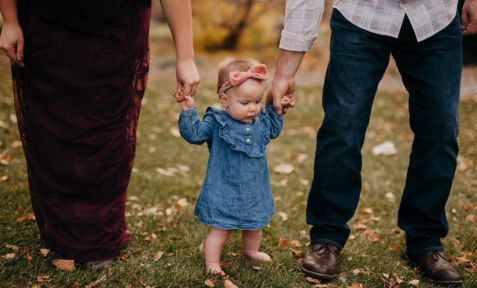 This is really a paper good, but I won’t tell anyone if you won’t! 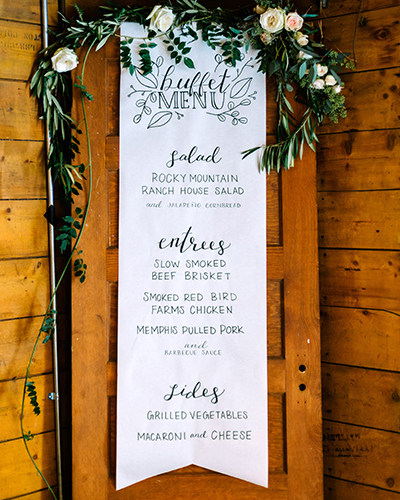 I hand-lettered our buffet menu on a paper scroll and let it hang down a vintage wooden door as part of our eclectic décor. This is a great example of my “handmade installation” pieces – a light curtain made of paper flowers. 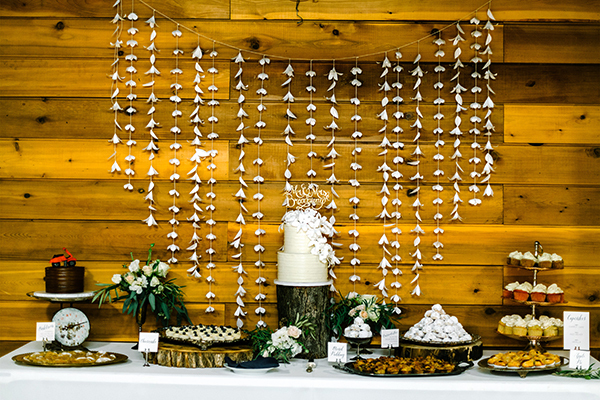 In this case it was made to compliment my paper flower wall photo booth backdrop and add some interest behind our dessert table display. 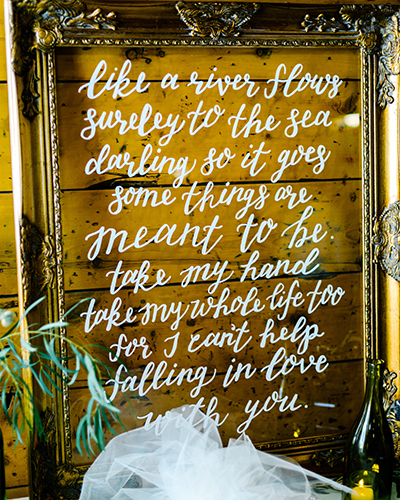 As an added piece of décor, I hand-lettered the lyrics to our first dance song, “Can’t Help Falling in Love” and displayed it on our guest book table. 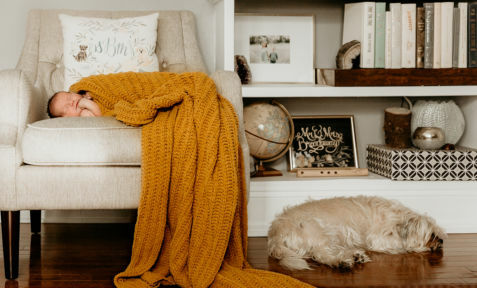 I’ve since created a few of these for other couples – they make a great gift and double as a nice piece of keepsake art for the newlywed’s home. 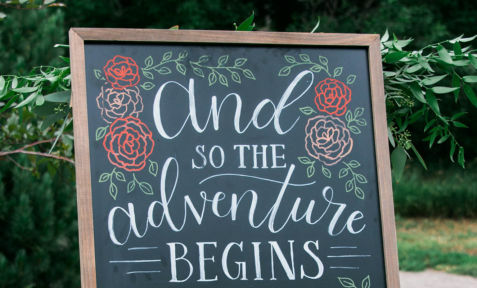 I’m a sucker for wedding chair signs! 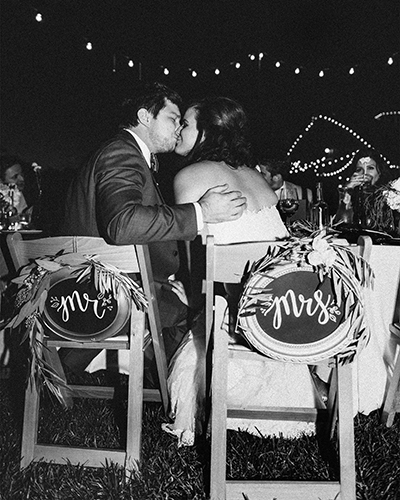 For our wedding I lettered Mr & Mrs chalkboard signs for the back of our chairs in a similar style as everything else, including some lovely botanical embellishments around the letters. 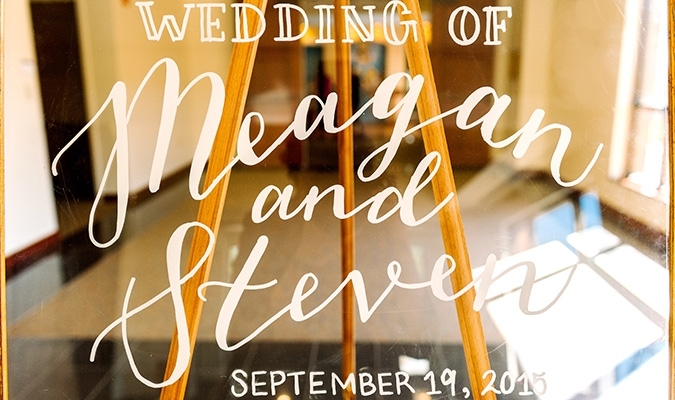 For design inspiration, see more examples of my custom wedding signage DIY décor here or look on Instagram under the hashtag #whimsysignage. All above photos were taken by Autumn Cutaia. 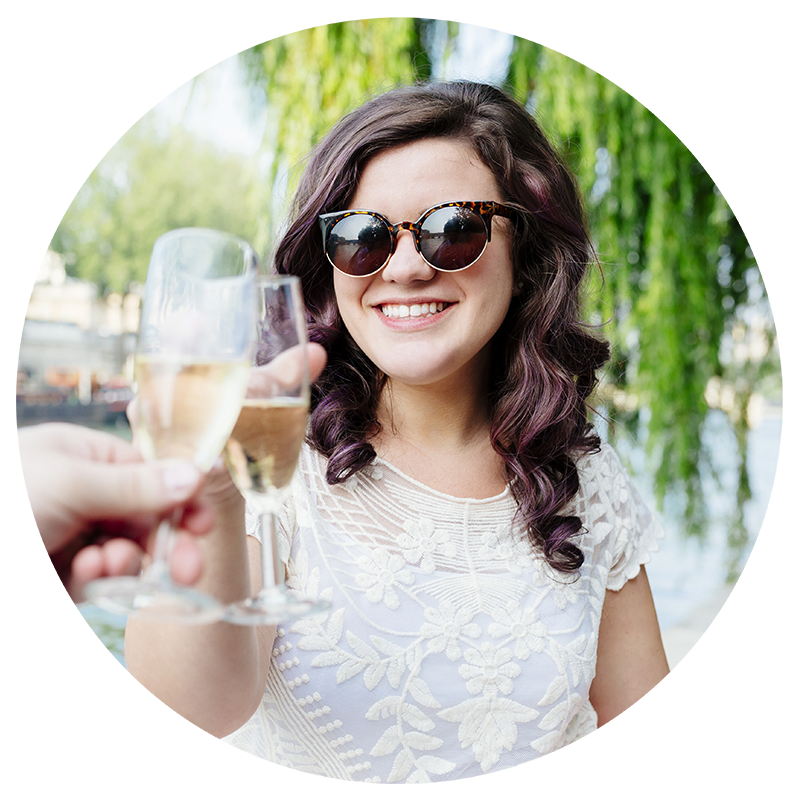 A special thanks for Orchid Princess Floral for all of the lovely garland accents that made my wedding signage pop and Hourglass Productions for setting everything up and making my vision come to life!